Analysis: The arrest reportedly stems from an unpaid ticket from an incident dating back to last November, when Fournette was cited for driving 12 mph over the speed limit, per Justin Barney of WJXT 4. It's not certain if the running back will face discipline from the NFL. Fournette (ankle) and executive vice president Tom Coughlin recently met to discuss the running back's disappointing season, clearing the air in the process, Ian Rapoport of NFL Network reports. 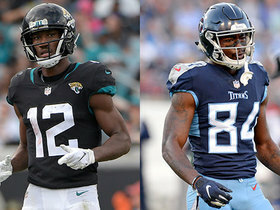 Jaguars VP Tom Coughlin said he was "disappointed" in Fournette (ankle) and T.J. Yeldon's actions during Sunday's loss to the Texans, Michael DiRocco of ESPN.com reports. Fournette (foot/ankle) is inactive for Sunday's regular-season finale against the Texans. Analysis: In Fournette's absence, some combo of Carlos Hyde, T.J. Yeldon and David Williams will be in line to handle Jacksonville's Week 17 backfield duties. With a time-share likely in effect, neither of the trio is an especially high-percentage fantasy play. Fournette (foot/ankle) is listed as doubtful for Sunday's season finale against the Texans, Michael DiRocco of ESPN.com reports. Analysis: With the doubtful designation, Fournette belongs nowhere near Week 17 fantasy lineups. In his likely absence Sunday, some combo of Carlos Hyde (knee, questionable), T.J. Yeldon and David Williams is in line to handle Jacksonville's backfield duties. Fournette (ankle) was not spotted at Friday's practice, John Reid of The Florida Times-Union reports. Analysis: Fournette was able to practice on a limited basis, but it looks he will sit out entirely Friday for the second day in a row. That leaves his status for Week 17 up in the air until the Jaguars release their final injury report of the week after Friday's practice concludes. 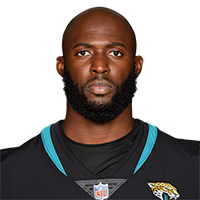 Fournette (ankle/foot) missed practice Thursday, John Oehser of the Jaguars' official site reports. Analysis: Fournette logged a limited session Wednesday, so Thursday's downgrade in participation is notable, though it remains to seen if it was simply a case of his reps being managed or indicative of a setback. 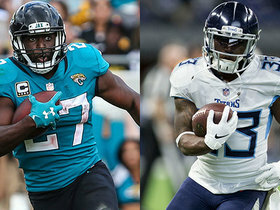 If Fournette ends up sidelined this weekend against the Texans, some combo of Carlos Hyde, T.J. Yeldon and David Williams would handle Jacksonville's Week 17 backfield duties. Updating a previous report, Fournette (foot/ankle) logged a limited practice Wednesday, according to John Oehser of the Jaguars' official site. Fournette (ankle/foot) isn't scheduled to practice Wednesday. Fournette rushed 18 times for 43 yards and one touchdown during Sunday's 17-7 win over the Dolphins. He also caught three passes for 28 yards. Fournette said Friday that he feels healthy heading into the Jaguars' Week 16 matchup with the Dolphins, but admitted his conditioning isn't where he wants it to be. "I could be in better shape," Fournette said. "I'm fine, though." Fournette (foot) practiced fully Wednesday, John Oehser of the Jaguars' official site reports. Fournette (foot) is expected to practice in some capacity Wednesday. Coach Doug Marrone said Fournette is dealing with a foot injury, John Reid of The Florida Times-Union reports. 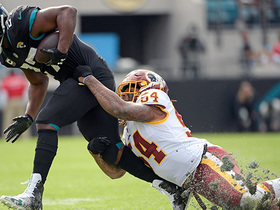 Fournette acknowledged that his lack of work in Sunday's 16-13 loss to Washington was partially a product of the Jaguars making an effort to get rookie Dave Williams some touches, John Oehser of the team's official website reports. Fournette rushed 11 times for 46 yards and added three receptions for 18 yards on four targets in Sunday's 16-13 loss to the Redskins. Analysis: This was another awful offensive effort from the Jaguars, who scored their lone touchdown on a punt return. Fournette's a talented running back, but he's finding little running room with defenses stacking the box and daring quarterback Cody Kessler to throw. 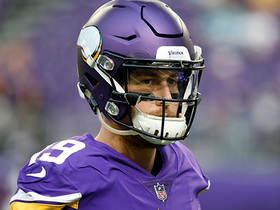 Perhaps things will get easier for Fournette in Week 16 against a Dolphins defense that just allowed three rushing touchdowns to the VIkings. Fournette carried 14 times for 36 yards while bringing in two of three targets for five yards in the Jaguars' 30-9 loss to the Titans on Thursday. Fournette rejoined the Jaguars on Monday after serving a one-game suspension, John Reid of the Florida Times-Union reports. Analysis: Minus Fournette in Week 13, the Jaguars beat the Colts, 6-0, on Sunday, with Carlos Hyde and T.J. Yeldon handling the team's backfield duties. Now past his suspension, Fournette is poised to head the team's running attack Thursday against the Titans. In three games played since returning from a hamstring injury, Fournette logged the bulk of Jacksonville's carries, en route to scoring five TDs in that span. 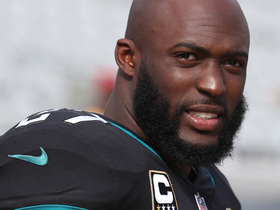 Fournette's one-game suspension was upheld Wednesday by independent arbitrator James Thrash. The running back will miss Sunday's game against the Colts before returning to the Jaguars' active roster the following day. Fournette is appealing his one-game suspension, with the hearing scheduled for Tuesday afternoon, Adam Schefter of ESPN reports. Analysis: Fournette has been suspended for Sunday's game against the Colts after playing a central role in a brawl during a Week 12 loss to the Bills. He hopes to have his ban overturned, but the Jaguars probably shouldn't count on a favorable verdict, considering Fournette came off the bench to throw punches at an opponent. Carlos Hyde and T.J. Yeldon will man the Jacksonville backfield in Week 13 if Fournette's suspension is upheld. Fournette received a one-game suspension from the NFL for unsportsmanlike conduct and unnecessary roughness in Sunday's 24-21 loss to the Bills, Ian Rapoport of NFL Network reports. Fournette was ejected from Sunday's game against the Bills following a third-quarter scuffle, John Oehser of the Jaguars' official site reports. Analysis: Fortunately for those who rolled with Fournette in Week 12 lineups, the running back logged 18 carries for 95 yards with two TDs and caught three passes for 13 yards prior to his early exit from Sunday's game. Carlos Hyde and T.J. Yeldon will handle the Jaguars' backfield duties for the remainder of the contest. Fournette rushed 28 times for 95 yards and a touchdown while catching both of his targets for 46 yards in Sunday's 20-16 loss to the Steelers. 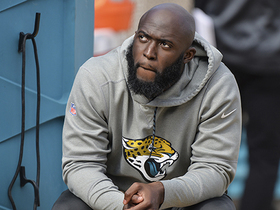 Fournette indicated Thursday that he's fully confident in the health of his hamstring after playing 39 of the Jaguars' 75 offensive snaps (52 percent) in the 29-26 loss to the Colts in Week 10, John Oehser of Jacksonville's official site reports. "I don't second-guess my injury that I had or nothing like that. 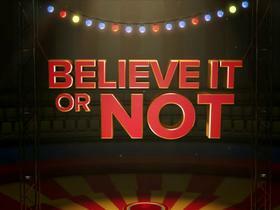 I go out there and play full force," Fournette said. Fournette carried 24 times for 53 yards and a touchdown Sunday against the Colts. He also caught five passes for 56 additional yards and another score in the 29-26 loss. Fournette (hamstring) does not carry an injury designation for Sunday's game against the Colts after practicing fully all week. Fournette (hamstring) practiced fully Wednesday. Fournette (hamstring) is expected to participate in practice Wednesday. Fournette (hamstring) didn't appear to have any limitations at practice Monday, Michael DiRocco of ESPN.com reports. NFL Network Insider Ian Rapoport updates us on Jacksonville Jaguars head coach Doug Marrone and running back Leonard Fournette's relationship. NFL Network's Tom Pelissero explains why the Jacksonville Jaguars voided the guarantees in running back Leonard Fournette's contract. 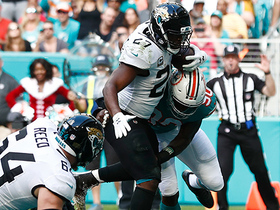 Jacksonville Jaguars running back Leonard Fournette rushes for a 25-yard gain. NFL Network's "NFL Fantasy Live" crew reveals their bold predictions for Week 15. The "NFL Fantasy Live" crew discuss the fantasy fallout from the Tennessee Titans' win over the Jacksonville Jaguars in Week 14. 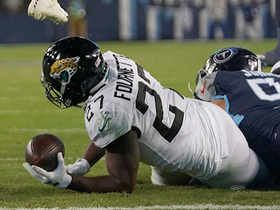 Tennessee Titans linebacker Rashaan Evans stops Jacksonville Jaguars running back Leonard Fournette at the goal line. 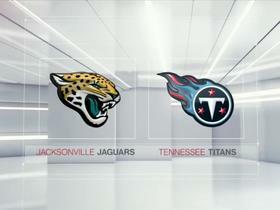 NFL Network's Adam Rank and Cynthia Frelund analyze the top players heading into Thursday night's matchup between the Jacksonville Jaguars and Tennessee Titans.